All of us have a dream, some change we want to make in our life, a change that will make our lives so much better. Unfortunately, too many of us are not making those dreams come true. The reason we aren't is because we aren't motivated. And the reason we aren't motivated is because no one ever taught us how to motivate ourselves. We are taught how to dream, but there was nowhere for us to learn the skill of motivating ourselves. Until now. 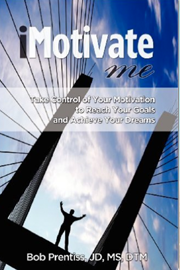 iMotivateMe, Take Control of Your Motivation to Reach Your Goals and Achieve Your Dreams, teaches us that skill. Rather than presenting a series of unrelated tips focused on the average person, this practical manual guides you in creating a plan of motivation tailored uniquely to your likes and dislikes, your motivators and your demotivators, the things that rob you of your motivation. The book is based upon the model for self motivation developed by author, Bob Prentiss, after three years of research on motivation during and subsequent to achieving his Masters of Education. Once you learn the skill of motivating yourself and keeping your motivation high you will be able to make your dreams come true.